A much-travelled regional journalist whose career CV included qualified pilot and accomplished musical entertainer has died aged 56 just two months after getting married. 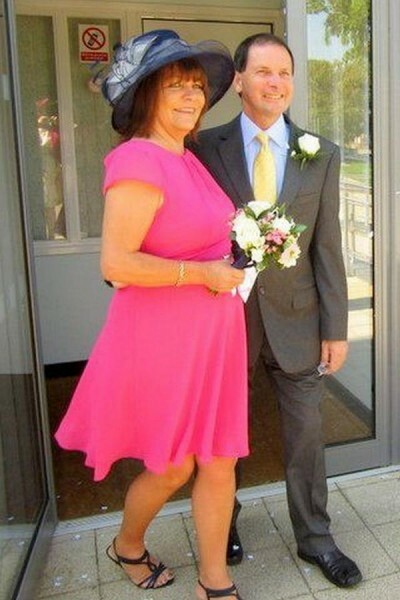 Steve Hunt wed his partner of five years, Pauline Messenger, at Yeovil Register Office – knowing he only had weeks to live after a 12-month battle with cancer of the oesophagus. Steve’s 35-year career in journalism began when he joined his father Michael’s Weymouth-based national newspaper and television press agency. His first newspaper job was the Bridport News where he completed his training. Tributes have poured in from stunned ex colleagues for the “one-off” reporter and sub-editor. Former Bridport News editor Margery Hookings said: “I’m very shocked and saddened by Steve’s death. He was way too young. From Bridport, Steve went to Wincanton as a staff reporter for the Western Gazette before going to the Western Daily Press in its Swindon office. Next stop was the Swindon Evening Advertiser specialising in crime reporting. He had a spell in PR for booksellers WH Smith in London before moving back to his south coast home of Weymouth in 1999 to join the Dorset Echo as a sub-editor where he ended his news career. Nearly five years ago Steve and Pauline went to live in Castle Cary, Somerset, where he set himself up as a solo music and singing act called Strictly Entertainment – travelling around nursing and retirement homes and clubs in Dorset, Somerset, Devon, Hampshire and Wiltshire. Apart from newspapers, his interests from childhood lay in flying, travel and astronomy. He visited many countries around the world and this led him to train as a pilot, eventually earning his private pilot’s licence some six years ago. His first passenger after qualifying was his dad and he proudly flew him over the Dorset, Wiltshire and Hampshire countryside to the Isle of Wight and back, apologising for a bumpy landing at the airfield near Shaftesbury which in fact his dad had thought was remarkably smooth. Steve was also an accomplished paraglider. Only three months ago, despite being seriously weakened by his illness, he bought himself a new paraglider and launched himself off the cliffs near Bridport and circled the skies for 30 minutes. Steve, who was the eldest of three sons of retired journalist Michael Hunt, died peacefully at his home in Somerset, with his wife and members of both families at his bedside. It’s register office not registry office! Bernard, it’s Register Office, cap R, cap O. Forget pedants, what a gutsy guy. To resort to petty pedantry on a story like this is Pig Ignorance – cap P, cap I. Grow up, for Christ’s sake. As for Steve, I salute him for guts and spirit. I didn’t know him, but he was obviously a multi-talented man who lived a full life and brought humour into the lives of others. It’s a tragedy that he was not granted many more years of love and laughter with his new bride. As a fellow newsman, I am proud to think blokes like him graced my profession for so many years. Hear hear. Go for it Brassington over petty Bernie Smythe (did Bern ever work in Slough?) and yes, Steve was a decent good guy.